A'van NSW is the exclusive distributor of A'van products in New South Wales. With three sites (Penrith, Nowra and Morisset) conveniently situated to cover the state, we are proud to represent the most innovative, progressive and unique RV manufacturer in Australia. A'van is Australia's most popular choice of camper. The unique engineering design behind the Aliner, Sportliner, Cruiser and Cruiseliners enables full assembly in less than 30 seconds. Best of all, their 100% insulated solid wall construction means no canvas. Sydney Region: 2142 - 2150 Castlereagh Road, Penrith NSW 2750. Telephone: (02) 4721 2222; Fax: (02) 4721 4444. Central Coast / Newcastle: 57 Alliance Ave, Morisset NSW 2264. Telephone: (02) 4970 4131; Fax: (02) 4973 4121. South Coast (Nowra): 334 Princes Highway, Bomaderry NSW 2999. Telephone: (02) 4422 4200; Fax: (02) 4422 4211. Photos on this page were supplied by the A'van NSW in March 2010. A'van campers have established themselves as an innovative alternative for people who wish to travel light but do not want the hardships that accompany the use of canvas. These patented campers are fully insulated with an extremely easy and quick setup time to allow more relaxation and less stress for the 'happy A'van camper'. A variety of floor plans combined with a multiple choice of external dimensions and tare weights mean that just about any vehicle can happily tow one of these units. The A'van campers weigh from only 350 kilograms in the Weekender through the Sportliner, A'Liner, Cruiser ranges, to 900 kilograms in the Cruiseliner, so most vehicles do not even notice them on the back. With a rugged Australian made hot dip galvanised chassis supporting a tough dirt resistant, fully insulated cabin, these no nonsense quality Australian made campers are guaranteed to deliver years of enjoyable travelling holidays. The A'van pop-top is designed to be lightweight, reliable and easily towed with a family sedan. Features, features and more features describes the range of A'van pop-tops almost completely. The value for money is second to none as many happy A'van customers can vouch for. With over fifteen layouts available there is a floor plan to suit everybody's needs and desires. A'van seek the best materials and equipment available in the construction of the pop-top range and have worked hard to achieve quality, reliability and innovation in designs. We have vans for families, retirees and the weekend escapers. No other caravan can claim to be better insulated from the extremes of cold or hot weather with an onboard battery system and standard hot water system luxury is the norm for our lucky A'van owners. Hot dip galvanised chassis and storage locker linings mean less maintenance and more time away. Integrated fly-screen / blockout screens are standard and supply all the comfort and privacy anyone could and should demand. A high rigidity body shell built from dirt resistant, easy clean insulated sandwich panelling sits upon an Australian made high torsion chassis that with the long lasting benefits that make life a breeze , regardless of how much of the country you travel, it will always be a pleasure in an A'van pop-top caravan. Slideouts: Combining the very latest in innovation and design, the Ray series of vans are compact and lightweight, making them easy to tow with most medium sized sedans. Of course, the Ray series are also exceptional fuel savers. Setup is simple: The slide-outs rear door lifts easily with the assistance of heavy duty gas struts, and the back wall slides smoothly outwards locking into place. Back inside the double mattress folds down onto a solid base. Within seconds, an entire bedroom with large double glazed window is complete. The A'van slide-out also features generous living area because, even with the extension closed, no bed space is taken from the basic floor area. In more ways than one the Ray extends the boundaries for RV travel. Features, features and more features describes the range of A'van caravans almost completely. The value for the money is second to none as many happy A'van customers can vouch for. With over eight layouts available (excluding the Eurostar range) there is a floor plan to suit everybody's needs and desires. 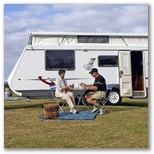 We have caravans for families, retirees and the weekend escapers. No other caravan can claim to be better insulated from the extremes of cold or hot weather with an onboard battery system and standard hot water system luxury is the norm for our lucky A'van owners. Hot dip galvanised chassis and storage locker linings mean less maintenance and more time away. Integrated fly-screen / blockout windows are standard and supply all the comfort and privacy anyone could and should demand. 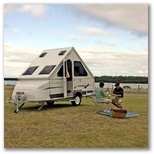 A high rigidity body shell built from dirt resistant, easy clean insulated sandwich panelling sits upon an Australian made high torsion chassis that with the long lasting benefits that make life a breeze, regardless of how much of the country you travel, it will always be a pleasure in an A'van hardtop caravan. A'van Euro Star: The 2008 A'van Euro Star range combines the finest aspects of interior comfort with distinctive exterior styling. Superbly moulded fibreglass front and rear one piece panels, featuring premium quality Gelcoat protection with a superior waterproofing design. The Euro Star range has an extensive list of standard features explaining its reputation for offering greater value than others in this elite class. All A'vans are assembled using fully insulated sandwich panels which offer superior strength, water and dirt resistance with a modern appearance that is resistant to ageing. The 'Centurion' chassis is intelligently designed to provide maximise torsional strength and then 'Hot Dip' galvanised for extreme long term protection with the least maintenance possible. On top of this 'AUSTRALIAN BUILT' trailer is constructed A'van's own European style caravan incorporating leading edge solid timber furniture which uses state of the art edge banding technology to produce a sophisticated and appealing living environment. The 'A' grade finish of these Euro Star caravans combined with versatile floor plans and creature comforts will give our discerning customers many years of travelling pleasure. Ovation Motorhome: Superbly appointed with finest quality features, the Ovation offers luxury accommodation features for the discerning traveller. Beautifully crafted timber furniture and deluxe fittings add comfort and functionality to the spacious living and kitchen areas. The mix of quality features adds to the Ovations appeal, including a full ensuite with separate shower & toilet and a generous blend of LED directional lighting and halogen downlights. The Ovations state-of-the-art sub-floor construction enables safer & more efficient housing of the motorhomes electrical and plumbing assemblies...while giving you more storage options for the things you can't live without. If you are in the market for a new RV, do not do anything before you come in and see the Ovation at one of Avan NSW's outlets.